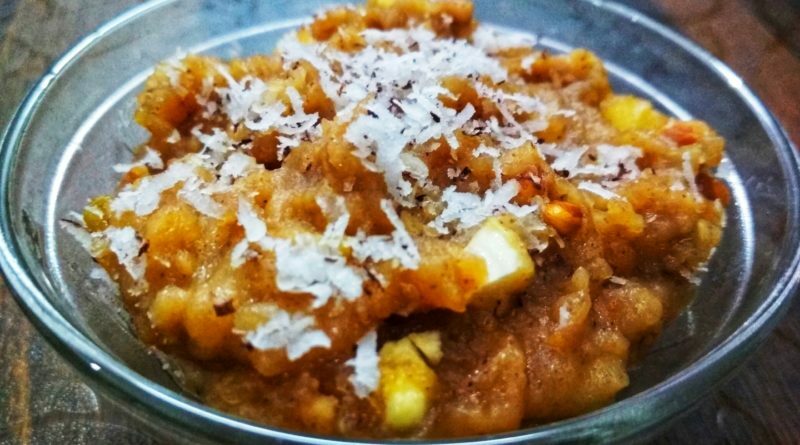 Singhare Ka Halwa is usually made during fasting or vrat .it very easy and quick to prepare and tasty also. In English singhare ka atta is called water chestnut flour. singhare ka atta is also used to prepare singhare ki roti. Desi Ghee (Clarified butter) – 4/5 tablespoons. Singhare ka atta (Water chestnut flour) -½ cup. Water (Boiling hot) – one cup. Cardamom powder (Green seeds)- 1/4 teaspoon. Chopped dry fruits for garnishing Almonds, chironji, cashews. Start with heating desi ghee in a thick coated frying pan keep the flame on low heat. Add singhare ka atta (Water chestnut flour)and keep mixing it well. keep roasting the mixture for 8 to 10 minutes or till it turns brown in color and you start getting a nice aroma of roasted flour. At the same time boil one cup of water. add hot water into the flour and keep stirring slowly this will avoid lumps. Once water is absorbed add sugar and keep stirring the mixture on low flame. On medium to low flame keep stirring and cooking the mixture till ghee starts releasing from sides. Next, turn off the flame add cardamom powder and chopped dry fruits and give a nice mix. top up with freshly grated coconut your Singhare Ka Halwa is ready to serve. 1. To make lump-free halwa always add hot water.